It was bittersweet at this year’s Farnborough Air Show as the Bombardier CSeries took to the skies resplendent in a new Airbus paint job. The tie up with Airbus will keep the Montréal production line humming for years to come. 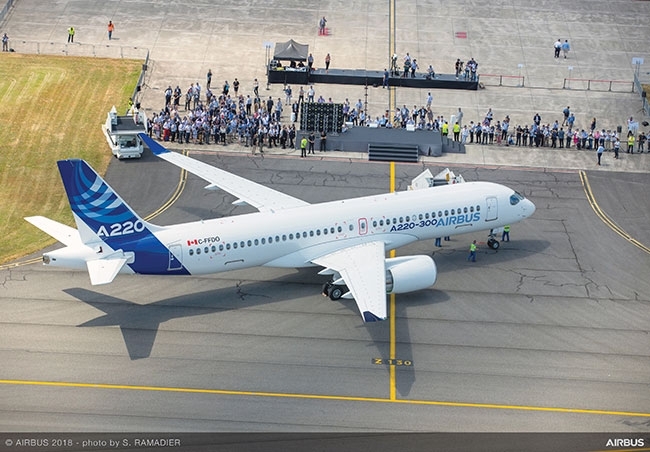 Still, the Airbus A220’s coming out party was a reminder that Canada’s shot at a game-changing crossover from regional jets to mainline airliners fell short of the finish line. No doubt the Brazilians will feel a similar pang of regret next year in Paris, although there is no indication yet that the proposed 80 per cent takeover of Embraer’s airliner business by Boeing will include a rebrand of the next generation of the popular E-Jet family. The Airbus deal is reminiscent of the North American automobile crisis of 2009, when Italy’s Fiat walked away with 35 per cent of bankrupt Chrysler for no cash and billions of dollars in U.S. bailout money in exchange for advanced automotive technology and management expertise. Bombardier will concentrate on revitalizing its regional aircraft product line and corporate jet business. Both businesses made a positive splash recently with the surprise unveiling of the Roll Royce-powered Global 5500 and 6500 at EBACE and display of the advanced Atmosphere cabin for the CRJ family at Farnborough. The Farnborough air display was a positive reset after the bitter cross border trade dispute that had the potential to sink the CSeries program, although a trade complaint by Embraer is still on the docket at the World Trade Organization. There was always a Janus quality to the Boeing case. Like the ancient Roman God of beginnings and ends, Boeing had one eye on how the American aerospace industry had underestimated Airbus, while keeping another on Asia and the inevitable emergence of a competitive threat by China. That is unlikely before 2025 at the earliest, but given the development period of a new airliner, seven years is just around the corner. An interesting takeaway from the Bombardier/Boeing dustup was the federal government’s response. Prime Minister Justin Trudeau certainly went to bat for Bombardier. Perhaps a bit too aggressively. Bombardier is a big piece of Canada’s $25 billion aerospace industry, but it is not the sole piece. Especially in western Canada, where Boeing’s largest plant outside of the U.S. is based. The federal government’s full-throated intervention did not change the outcome of the trade dispute. When the final bell rang, Boeing did not have much of a fight. But it contrasts sharply with the actions this government took three years ago, when it could have influenced an outcome. In November 2015, the newly minted government hastily tweeted a decision to uphold a ban on jets at Toronto’s city centre airport. Jumping the gun on a release of three local reports on the feasibility of jets, including an environment assessment. Clearly the government wanted to burnish its environmental credentials by virtue-signaling early. The action put into jeopardy Bombardier’s breakthrough Canadian order by Porter Airlines, and robbed the struggling airplane builder a global ‘test bed’ to demonstrate the versatility of its next generation jet and PW1500G powerplant. Compare this with the UK, where the A220 is thriving at the London City airport. The airplane is well suited to the airport’s short runways and steep approach. SWISS, the launch customer, connects central London with Zurich and Geneva. As more A220s roll of the line, this is just the beginning. Toronto’s Billy Bishop Airport is Canada’s ninth busiest. It does not compare with London City Airport (the UK airport does not neighbour a busy expressway to drown out airport noise, for one), and there would be no trans-Atlantic flights, although the A220 puts Vancouver and Los Angeles within reach. An extension of the main runway by 200 metres at each end would be required to support jets. This is hardly a “paving over the lake” as suggested by one MP, and would not increase the number of flights out of the airport. The debate about allowing jets to fly at Toronto’s waterfront airport will always be an emotional one for people who live in the city. Opening the airport to a new generation of quieter jets would not have altered the course of history for the CSeries. But it is fair to expect a government to put evidence over emotion. In rushing to judgement, the government came up short. David Carr is a Wings features writer and columnist.